Skip the lines - select courses on campus with advisors ready to help! Simply sign up for your session date and tell us a little about your academics. Then, an advisor will make your a personalized list of recommended courses. 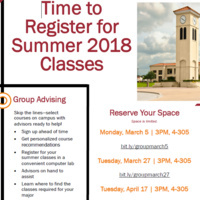 When you arrive to group advising, you will be provided with a brief overview of academic resources, as well as your specific course recommendations. Register right there in the computer lab with advisors on hand to answer any questions!